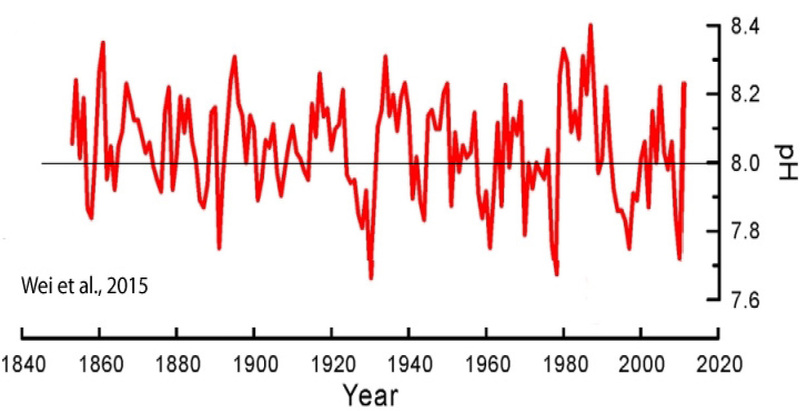 A modest long-term (1800s-present) declining trend in ocean pH values predominantly occurred prior to 1930, or before anthropogenic CO2 emissions began rising precipitously. 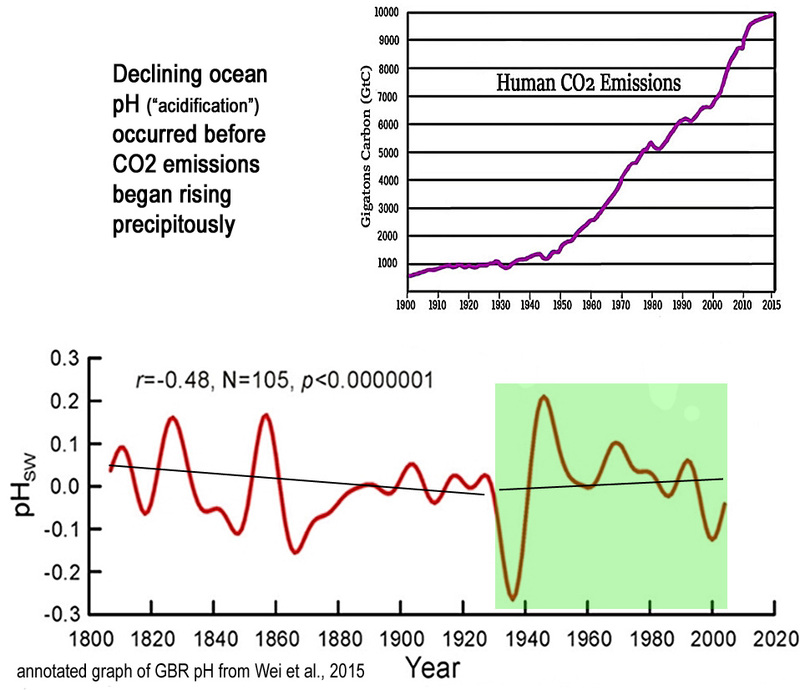 Since 1930, seawater pH trends have risen slightly, meaning sharply rising CO2 has been coincident with less, not more, ocean “acidification”. Is “acidification” occurring too rapidly for species to adapt? Scientists (Wei et al., 2015) estimate that the ocean’s global mean surface pH may have declined (i.e., become less alkaline and thus more “acidic”) by -0.07 to -0.08 in the last 200 years — from ~8.12 during pre-industrial times to 8.04 to 8.05 today. It is commonly claimed that this long-term decline in pH, or “acidification”, is occurring far too rapidly for the oceanic biosphere to adapt. Consequently, there are alarmist claims that the pH changes in the last few hundred years are so extreme they will lead to a mass extinction event. A pH change of -0.07-0.08 over 200 years is an overall long-term pH change rate of about -0.0003 per year. By way of comparison, from one season to the next, or over the course of less than 6 months, pH levels naturally change by ±0.15 pH units, or twice the overall rate of the last 200 years. On a per-decade scale, the changes are even more pronounced. Oceanic pH values naturally fluctuate up and down by up to 0.6 U within a span of a decade, with an overall range between 7.66 and 8.40. This is decadal rate of pH change is larger than the overall 200-year trend (0.07-0.08) by a factor of 8. If the oceanic biosphere was incapable of adapting to the modern rate of long-term change (-0.07-0.08/200 years), or to the frequently-realized seawater “acidic” values of 7.7 or 7.8, one would think this vulnerability would have been observed at some point in the last 200 years. Many of the highly cited pH trend studies choose a starting point from the recent decades rather than from a long-term record. Dore et al. (2009), for example, chose 1988. 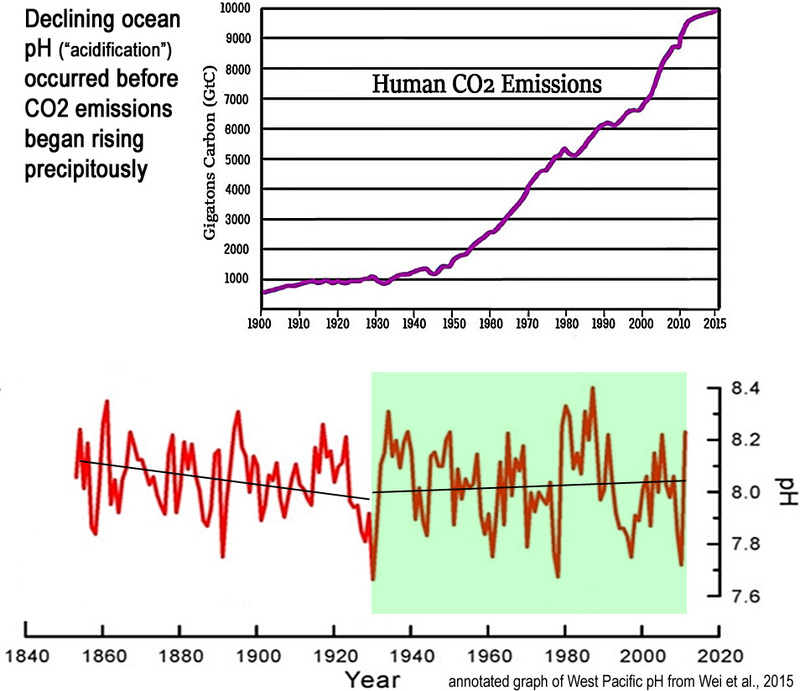 Using recent decades has the effect of illustrating that rapid pH decline, or “acidification”, coincides with dramatically rising CO2 emissions. This is the intended representation, of course, because it is assumed that we humans are responsible for “acidifying” the oceans. What if we choose 1930 as the “acidification” starting point? 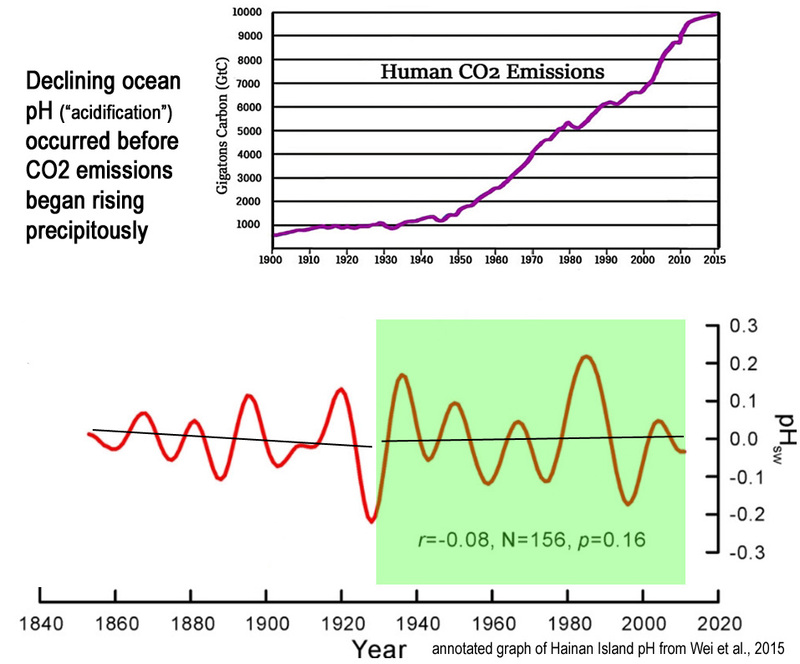 If CO2 emissions predominantly drive trends in oceanic pH, the correlation between pH decline and an explosive rise in emissions could presumably be established beginning around the 1930s, or when CO2 emissions began to rise dramatically. Interestingly, an entirely different pattern emerges if we use 1930 rather than more recent decades as the starting point for pH trend detection. Namely, the long-term decline in pH can mostly be found in the decades prior to the 1930s, or when steep increases in CO2 emissions were not occurring. The post-1930s period even suggests a slightly rising pH trend. In other words, after CO2 emissions began rising precipitously in the 1930s, the oceans have become less “acidic”. This determination would appear to undermine the claim that human activity, and not natural variation, is what drives the long-term declining trend (0.07 to 0.08) in oceanic pH. The bottom line with the true believers of cAGW is that CO2 would bypass normal physics, and just acidify the oceans, seas and inland waterways just because CO2 is in the atmosphere and available. As the above information shows this is not a credible thing to happen. 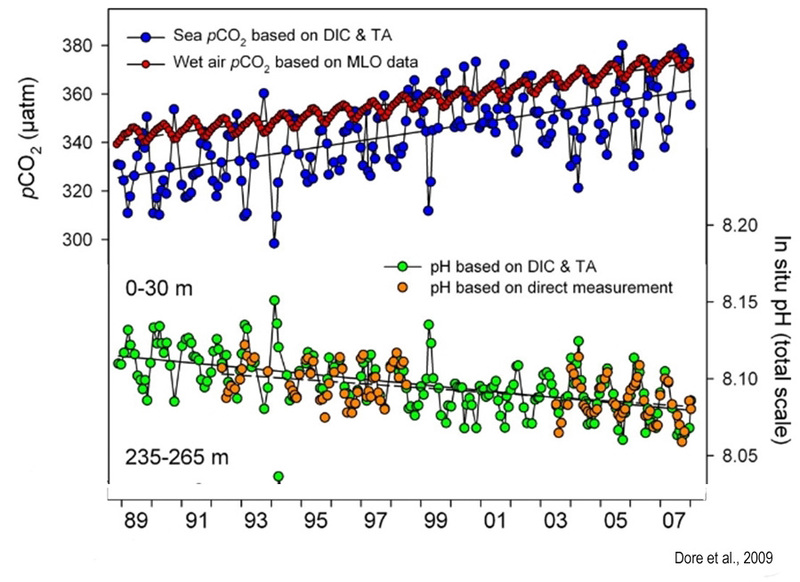 There are ~38,000 Gt of carbon dissolved in oceans (27ppm). Mostly as the bicarbonate ion HCO3- (90% of it). Total carbon available in fossil fuel reserves = 5,000 Gt. If all that fossil fuel on earth burnt, and all CO2 made from it then dissolved in the oceans it will raise the ocean carbon content to 31ppm. To put things into perspective: in contrast to the 27ppm of carbon, oceans have 35,000ppm of salt in them. It does not surprise me that burning one tenth of earth’s fossil fuels since the mid-18th century had so little effect. From the Wayback Macine (Internet Archive) we have this record of pH change over a 14 year period. 2. – Readings oscillate up and down seemingly at random, with a hint of possible seasonable variability. 4. 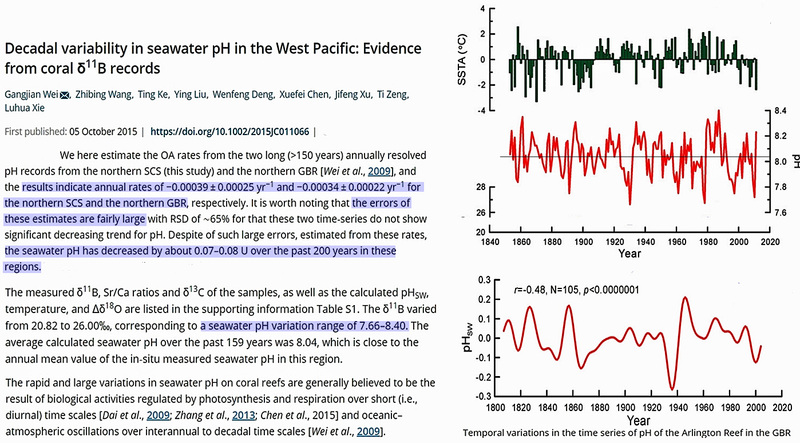 – The error bars massively dwarf alleged changes caused to oceans by man. I.e., no claim of altered ocean pH can legitimately be made. NOTE – It looks like the original may no longer be available on the net, so save a copy of the pdf if you want to find it later. Here’s a great article revealing the ugly truth about how the media pervert facts to terrify readers with dishonest support of an agenda driven narrative. Here Dr. Patrick Moore gives us some facts about Ocean pH. see here for written version. If sea life can survive the natural variability of ocean pH changes, the microscopic changes the activists claim are occurring are nothing to worry about, even if one could truthfully assert that they are occurring, which is currently scientifically impossible). 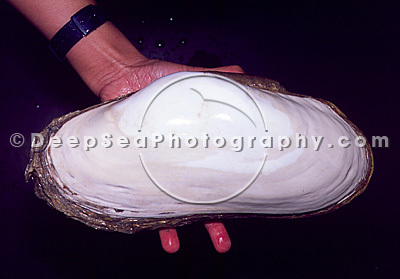 The giant clam, Calyptogena magnifica, lives along with other muscles in the vicinity of undersea vents, where the pH actually IS acidic. Not only do their shells not dissolve, but they get quite large. And finally, for now, some info on how some measure pH, and some of the drawbacks and pitfalls. What statistical methods did you use to slap your own trend lines on these figures? Based On Above Facts, at death, a Human Weighs 1,404 Pounds and is 82 Feet Tall. Sun gets warm, oceans get warm, release gases including water vapor & CO2, protects the earth. Sun cools, oceans cool, releases less gases, protects the earth. So if as the cAGW advocates believe then carbonated water could be a dangerous chemical. So all you cAGW advocates better watch out that you don’t spill that (CO2) fizzy water at the bar, it might etch away your teeth and face. Also of note is that CO2 is always dissolved in rain water, making it mildly acidic. This acidic water eventually flows via rivers to the seas and oceans — since forever — and has yet to acidify the oceans.